If you or someone in your family packs a lunch to work, and you're not content with smooshing all your food into a mini-cooler or a brown bag, take heart. There’s a better way. 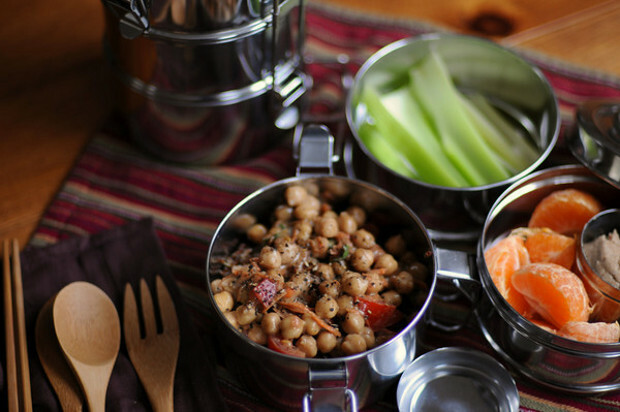 Behold the stackable, food-separating, shiny awesomeness of a tiffin carrier lunchbox. This is such a remarkable item. My husband and I are retired, so no longer packing lunches to work. But we sure love this for road trips, outdoor concerts in the park, and picnics. 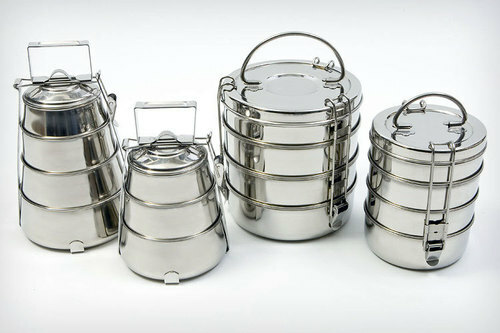 Tiffins—derived from the Indian word for snack—are the East Indian equivalent of the iconic steel lunch boxes that mid-century working men in United States carried. 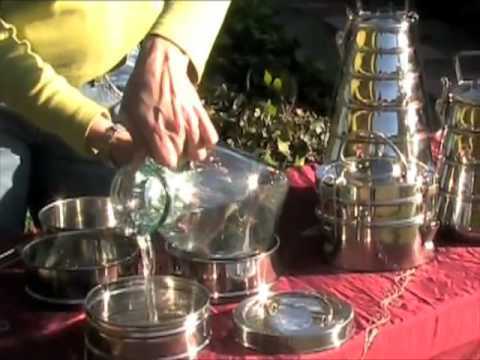 Essentially a tiffin is a series of stacking containers and lids secured by a tension clip on the side. Each compartment can be filled with a separate food or liquid. Prices range from $12-$40, depending on the number of tiers and size you select. 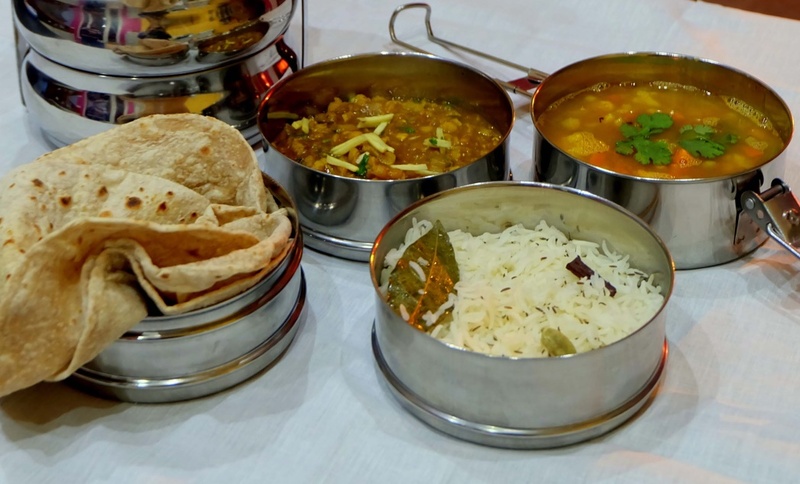 Tiffins are made from food-grade stainless steel, so they'll last you for a lifetime and provide endless easy conversation-starters at lunch tables. 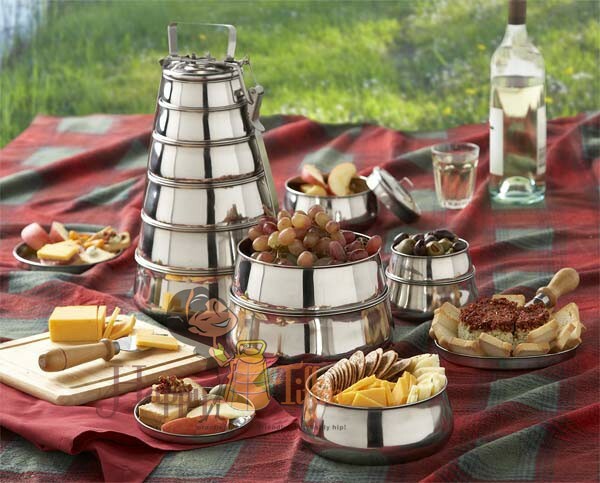 And these stainless steel carriers are dishwasher safe. Also, unlike plastic, they will not retain odors and they won’t stain. Be aware, however, that you can’t cook or bake in them (not that I would want to). Tiffins have been around for 50 years and the design hasn’t changed for a reason—it just works. Simple. Beautiful. Functional. They will keep food hot or cold for around an hour. However, for something you want to be thoroughly cold (such as anything containing mayonnaise), you can put an ice pack in the middle tier to keep things cool longer. For top layer: The second largest layer usually contains something refreshing like a salad with dressing on the side. For the middle layer: This is often the bulk of the meal, a protein-rich and flavor-packed dish that is eaten over the rice or scooped up with the bread. Chicken chow mein, meatballs and gravy, or chili are good choices. For the fourth layer: If you're lucky enough to find a towering, four-story tiffin, pack the fourth layer with a dessert or snack to be enjoyed later in the day. It can sit on the bottom or the top. And of course, your homemade soups, stews, and chowders will work well in a tiffin, also. This is such a great way to have a homemade meal when away from home!